Manufacturer of a wide range of products which include kiosk floor stand with security lock for ipad air 2/3/4 and ipad air pro wall mount tablet locking enclosure secure. Mounted height measures about 46" inches from floor to iPad USB charging cable wired through the inside of the pole by using a charger box. Wall Mount Tablet Locking Enclosure Secure Lock & Key for tablet Samsung iPad 2-4, Air, Pro 9.7 Safely and securely place your iPad on display. 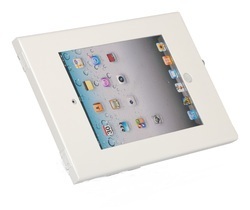 The iPad anti-theft wall mount Stand can be installed on any wall or flat surface. Rugged and durable steel construction provides device security where needed. Allow Convenient access to your iPad when installed in high traffic areas like in an office, lobby, front desk, customer counter or showroom floor. Choose between landscape and portrait iPad orientation to fit any displaying need. You can also use the included accessory Tab to either allow or block access to the home button. The anti-theft iPad Stand comes with all the necessary mounting hardware and brackets to grant safe and Secure access to your device -- all while adding a professional and clean look. 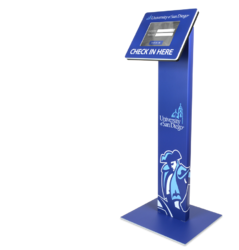 Looking for Tablet Secure POS Kiosks ?